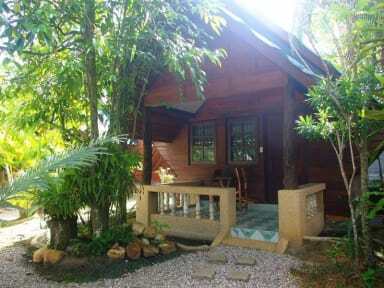 The Krabi Forest Homestay i Krabi, Thailand : Boka nu! Cancellation within 7 days will occur for only 1 night charge. No show will be 100% charge. Wireless Wi-Fi internet is free of charge and available throughout the public places around the hotel. In-Room Wireless Wi-Fi internet is also free of charge and available in every bungalow. Self-parking is free. No valet parking. No need to reserve for parking. Maximum Night Stay: 365 days/1 year. Only allow one extra bed with one extra guest per room. Extra bed comes in Twin/Single bed size only. Extra Bed for room only is 500 THB/Night/Room/person. Extra bed with breakfast is 650 THB/night/room/person. Bar, Restaurants, Coffee Shop, Ice Cream Shop, Laundry service, Salon, Spa, Massage, Tour Services, Shops, Car Rental, Motor Bike Rental, Bicycle Rental and more. Check Out Time: 07:00 am- 11:00 am. The maximum guests per room is 2 persons either adults, infants or children. We do not allow extra adult or infant/child of all age to share existing bed with already 2 existing guests in the room without adding extra bed. The extra adult or infant/child of all age adding to a room with already 2 existing guests in the room will be charged and one extra bed is required. Maximum only 1 extra guest either adult or infant/child of all age can be added in one room with 2 existing guests. The maximum capacity of extra bed is 1 per room. One Extra bed is charged and always required for any extra person either adult or infant/child of all age per room. Extra bed without breakfast is 500 THB/room/day/person. Extra bed with breakfast is 650 THB/room/day/person. Additional fees may not calculated automatically in the total cost of some websites and will have to be paid for separately during your stay. Extra bed comes in Twin/Single bed size only. One extra bed can be added for each room. The extra bed without breakfast is 500 THB/day/Room/person. 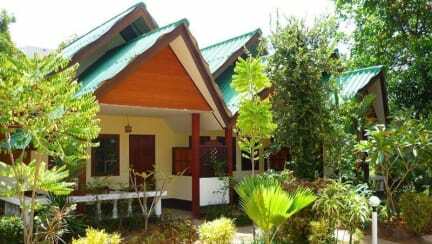 Extra bed cost with one breakfast included is 650 THB/day/room/person. Maximum of only 1 baby crib or cot per room. Baby crib or cot is count as extra bed, so if guests add one crib or cot, there will be no capacity to add any other extra bed in the room. Baby Crib or cot will be charged as extra bed and cost 500 THB/room/infant. The Airport Shuttle Bus from Krabi Airport will cost you 150 THB/person. The bus driver will drop you off in front of our place.